Donny Larson is a hell of a soundguy. He’s also a stand-up dude, taking on guardianship of his grandchild after both parents were killed in a senseless act of domestic violence. 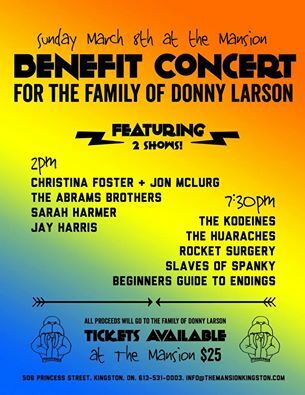 Help the Kingston Music Community support Donny and his family by raising a little cake for the little guy. Come see a wonderful show with many incredible Kingston artists and do a good thing while you’re at it.